“I really like Ana, she is an amazing piano teacher. The thing she does which I think makes her special is the fact that she teaches me about the composers as well as teaching me how to play the pieces. “Ana is an outstanding music teacher. 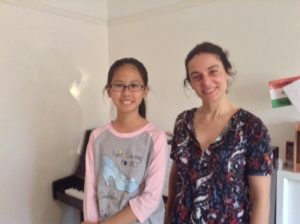 I started taking piano lessons with Ana as a complete beginner, having never played piano or any other keyboard instrument, I was able to play a small piece of music on the piano from the first lesson, which was amazing! I loved my piano lessons with Ana and looked forward to them every week. Ana’s teaching style is fun, friendly, encouraging, and you finish each lesson with a sense of accomplishment. She is very patient, professional and inspires her students through her own love of music. She also understands the difficulties of balancing music lessons with work and family commitments. It was also inspiring watching and listening to Ana playing the piano herself! Listening how a true musician play helped me to advance my techniques and to develop a musical ear for the different intervals and chords.